In the back, the Renaissance manor. 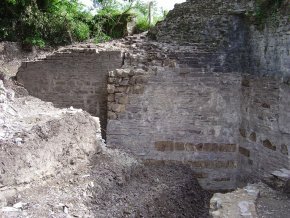 On the right, the remains of the enclosure. A little over a year ago we had asked the following question in a serie of articles (in French) : "what use are the laws on historical monuments ?". One of them discussed the château d’Ancenis, threatened by the Conseil Général de Loire-Atlantique, with the active complicity of the city and the Direction Régionale des Affaires Culturelles, and its plans for a modern building of mediocre design just a few meters away from the Renaissance palace (see article). Despite the protests of several associations, nothing has changed. 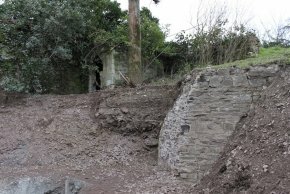 An extension has even been added to the original project and the work started a few weeks ago (ill. 1). Now this already scandalous case has been aggravated by an action punishable under French penal code, according to article 311-4-2, which provides for a sentence of up to seven years and 100,000 € fine for "the destruction, degradation or deterioration" [...] [of] "a building or object listed or inscribed, in application of the dispositions of the patrimonial code". 2. Part of the enclosure of the château d’Ancenis. 3. Part of the enclosure of the château d’Ancenis. The decree listing the château d’Ancenis, dated 2/11/77, covers "the ensemble of the remains of the enclosure including the towers, posterns, bastions and curtain walls". 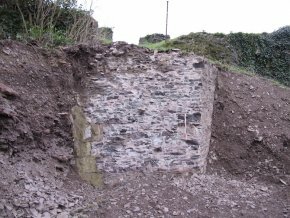 However, and the photographs published here prove it without question, part of the remains of this enclosed ensemble was demolished when digging the foundations for the new building . On the left (ill. 2), we show a photograph taken in 2004, on the right the same view but in January 2012 (ill. 3). Using certain stones as a reference point and comparing the two pictures, it is easy to see that this is indeed the same wall and that it was largely destroyed (ill. 4). 4. A comparison between the condition in 2004 and that of January 2012. (notably those encircled) and the extent of the damages is obvious. On the left, the wall was partly destroyed. or "only" buried in the ground. The Directeur Régional des Affaires Culturelles, Georges Poull, nevertheless dared to assert in Ouest-France, the regional newspaper, on 25 January  that "there is no destruction [of historical monuments]". We spoke with the regional curator for historical monuments of the DRAC Loire-Atlantique region, Luc Caudroy. He started out by saying that "1.50 m. of the foundations were secured". We asked if this was not a historical monument and if the "securing" was not actually "destruction". He only admitted that one part had indeed been "lifted", in his own words ("enlevée"), but repeated that these were the foundations and that the ground was not listed. Anyone can see that we are not talking about the ground here, that quite obviously the vestiges of the enclosure were listed as stated in the decree ("the ensemble of the remains of the enclosure") and that the "lifting" or "securing" consisted in fact in demolishing a part of this enclosure listed as a historical monument. We were already familiar with the term "deconstruction", we will now have to include the terms "securing" and "lifting" in a dictionary as synonyms. We would like to add that there is no need to be an architect or archeologue to observe that it was not necessary to "secure" this portion of the wall which seems very solid and that, at most and on condition it proved essential, it should have been consolidated. We will conclude by saying that these are not foundations as claims Luc Caudroy, but actually a part of the elevation as confirmed to us by Nicolas Faucherre, professor of Medieval Art at the University of Nantes. The photographs (ill. 5) show traces of a door destroyed by the recent works. One can see the rabbet of the piedroit on the right side, scraped by the backole bucket and the hole of the striker. Luc Caudroy thinks that these were the foundations because they were partly underground, as if the ground level had not budged since the Middle Ages. This is a consequence of appointing civil servants as "conservateur régional des monuments historiques" who have no experience, despite their title, in the field . Even supposing that these were actually the foundations, since when are those of a historical monument protected in its entirety not protected as well ? 6. View of the construction site of the château d’Ancenis. In front, the location of the main building. On the left, that of the annex. The two cut through the curtain wall. 7. Cross-section of the enclosure. An exisisting part was probably destroyed. Whatever the case, there is no doubt that this extension, as opposed to the original plans  will touch a listed building. Thus, it was not up to the Architecte des bâtiments de France alone to give his opinion, but also the French Ministry of Culture, through the DRAC. Luc Caudroy confirmed in fact that an application for a [structure] "backing up to a historical monument" had been submitted and that the Ministry of Culture had approved it. Although the current Minister could not be held responsible for the original project since it was approved before he took office and that he was probably not made aware of the work in progress, he is however now fully responsible for authorizing the permit, through the DRAC, for this extension. The question we asked at the beginning of the article might finally be summarized as follows : "what use is the Minister of Culture ?". The only answer he can and should give is to demand the immediate halt of the work, bring in an outside expert to certify the partial destruction of a historical monument - since his government employees assert the opposite, contrary to the evidence - and apply the necessary sanctions. Unless this is done, the answer will be, as is often the case : "nothing." If the Minister fails to react, the citizens will once again have to voice their opposition to an act of official vandalism : the Association pour la protection et la promotion du Château d’Ancenis has taken the matter to court before the Tribunal Administratif protesting the building permit and the work in progress. Unfortunately, this legal procedure does not provide for suspending the work. We find it extraordinary that the prefect asserted in a letter, dated 1st September 2010, addressed to the association A2PCA that : "the enclosure of the château is not protected as a historical monument" and added two lines further : "the listing as a historical monument [...] concerns only the following parts : the ensemble of the remains of the enclosure including the towers, posterns, bastions and curtain walls [...]". In other words, first one thing then the opposite, a lie and then the truth, all in the same sentence. Château d’Ancenis : le chantier peut continuer, interviewed by Roberte Jourdon. Luc Caudroy, who spent most of his career at the French Ministry of Defense, serves as a Conservateur Régional des Monuments Historiques [a fact added after the article appeared]. Fortunately, many other regional curators for historical monuments are indeed perfectly competent.